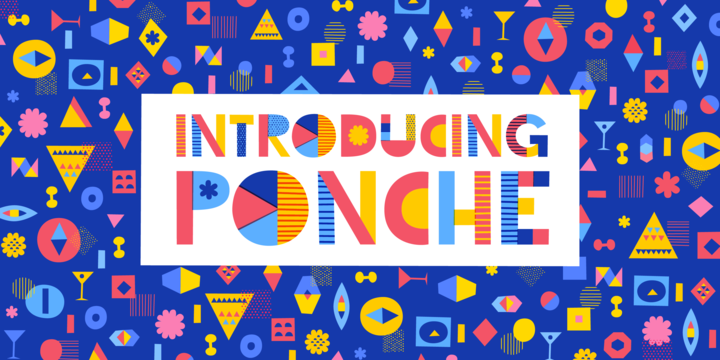 Ponche is a colection of colofonts created by Juliana Pedemonte together with Alejandro Paul and published by Sudtipos. This playful font is available in file with a pre-definited color palette. It is ideal for display use, poster, web, magazine, advertising etc. Have fun! Note: To use the font at full capacity, install Adobe Photoshop CC2017 or Adobe Illustrator CC2018. Price: both fonts for only $39. A font description published on Monday, May 14th, 2018 in Alejandro Paul, Fonts, Juliana Pedemonte, Sudtipos by Alexandra that has 1,586 views.